Step 1: Go to Statements (under Merchant Account in the left-hand sidebar). Step 2: Select the year and month for which you'd like your account statement. Step 3: Please select "CSV" as the desired format for your monthly statement, and click Get Statement. This will download the CSV file to your computer. You may need to add, alter, or rename fields in this spreadsheet in order to prepare them for upload into your particular QuickBooks setup. For example, if certain donations should be restricted to a specific fund, or if your processing fees need to be applied to a specific expense account, you will need to indicate these in an additional field. Step 5: After adjusting your statement to your needs, you can forward this to your bookkeeper or upload it to QuickBooks. Your monthly statements become available on the 10th of the following month. You can also sign up for statements to be automatically emailed to you or your bookkeeper. Please be sure to consult with a certified accountant to make sure your QuickBooks set set up correctly for your particular organization. 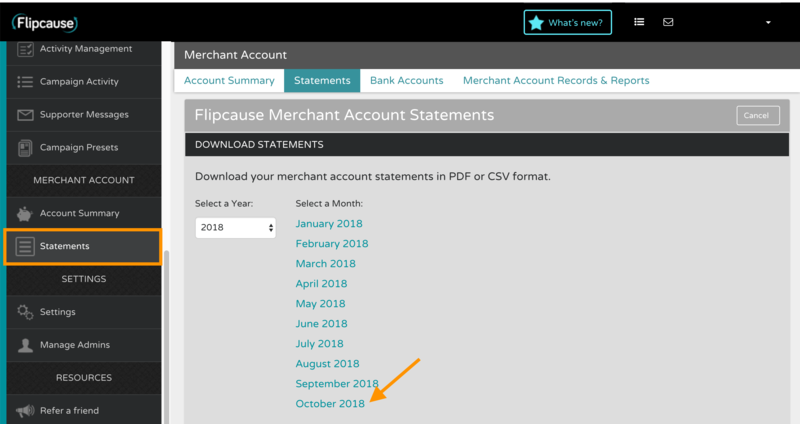 Make sure to also share this information with your accountant and bookkeeper so they know how to treat your Flipcause Merchant Account - it's just like any other Asset Account owned by your organization. You should also refer to QuickBooks help articles for the latest updates on how to log your donations correctly into QuickBooks.